Whether working on new sound is your passion or a profession, you need a great music making tool to get the desired results. Well, it is not easy to find a software that needs minimal efforts and works exactly the way you want. If you’re one of them, then don’t worry we got your back. Here is the list of the best free audio editing software you can rely on for creating your masterpiece. Platform: Windows, Mac, and Linux. Audacity is an open source and cross-platform software that is perfect to use when recording and editing multi-track. It comes with tons of downloadable plug-ins that enrich the software even more. This incredible tool supports 16-bit, 24-bit, and 32-bit. With Audacity, you can record multiple channels at once. It let you export MP3 files with the optional LAME encoder library without any trouble. It has inherent built-in effects such as echo, reverb, reverse, distortion, limiter, paulstretch, and phaser. 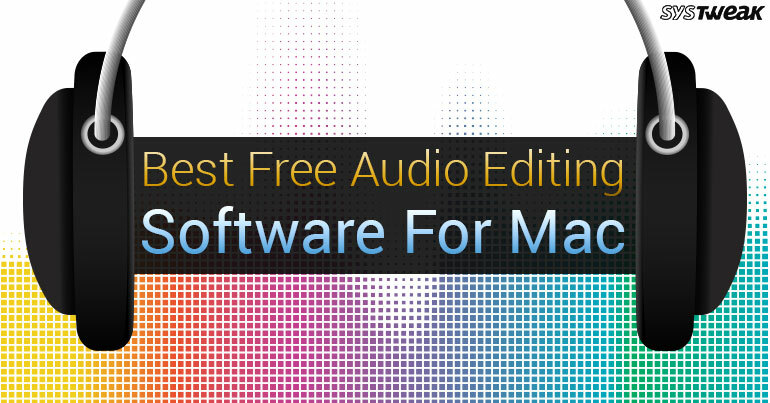 It is one of the best free audio editing software for Mac and Windows. It is a professional music editor that allows you to cut, copy, paste and add effects like reduce noise, amplification in your recording. Wavepad supports almost all the file formats such as flac, wma, vox, gsm, au, ogg and aif. You can search, scrub, and bookmark audio for your desired and precise editing. You can simply create bookmarks and regions to rapidly find, recall and assemble segments of long audio files in real time. It comes with various audio effects including amplify, echo, reverse, normalize, envelope, equalizer, reverb, etc. Wavepad comes with user friendly interface that allows you to utilize non-destructive audio editing in just a few minutes. You can create a masterpiece with up to 255 tracks. You can select between 28 players from popular genres, for example, Rock, Hip Hop, EDM, and Alternative. With GarageBand, you can easily shape any music of choice from the library with a custom set of buttons, knobs and sliders. The tool allows you to create a ringtone of your favorite music, export to your iTunes library, or share it directly to SoundCloud. With Ocenaudio, you can easily edit and analyze your audio recording with ease. Apart from offering an incredible waveform view of your audio files, it also provides a strong, effective and complete spectrogram view. You can simply analyze spectral content of your audio signal in a spectrogram view along with maximum clarity. It is capable of supporting VST plugins. You can get real-time preview of effects. The software comes with a clean, modern and easy to use interface. With Ocenaudio, you can effectively edit your large files in no time. Platform: Windows, Mac and Linux. LMMS is another cross-platform tool and music editing software. With LMMS, you can straightforwardly create, edit, melodies, beats, synthesizing and mixing sounds, arranging samples, etc. It’s a well-designed software for musicians and individuals. It is built-in 32-bit VST instrument support. You can easily playback your notes via MIDI or typing on a keyboard. It lets you import MIDI files and Hydrogen project files without any troubles. You can compose, sequence, mix and automate songs at one place with user centric interface. Overall, all the above mentioned free audio editing software are full-featured with tons of useful and unique features. Download the one you liked the most and let us know what your opinion.